There comes a time once in a while where you have to face the little details of home maintenance: gutter cleaning. No matter how much you postpone it, you know that you still have to do it. You would rather do anything else in the world than climb up on a ladder and spend half a day cleaning your gutters from dirt, fallen leaves, and insects. The bad news is that your gutter system needs cleaning and repairs twice a year. The good news is that you don’t have to do it; we can do it for you. Gut-R-Dun is a professional company that offers exterior services to people who would rather spend their free time enjoying pleasant activities instead of dealing with clogged gutters. We offer you a complete range of services from eavestrough cleaning to gutter repairs and replacement of damaged downpipes. We spare no effort in the process because we value quality above everything else. What we offer is excellent services, attention to details and a chance for you to enjoy your day while professionals work on your gutters. One of the big advantages of our Penticton eavestrough cleaning services is that you also get to have your eavestrough checked for issues. 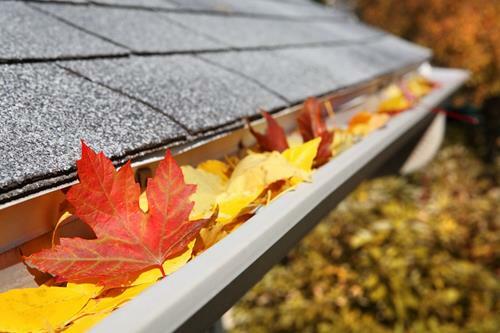 An expert hired to clean your gutters is able to find issues and and bring them to your attention, saving you a lot of money and stress in the future. Imagine this service as a bonus; you don’t have to pay to have a professional check your gutters because when cleaning it, they will do it anyway. It may be a small issue at first but, if you fail to have your gutters checked in time, this issue can transform into a bigger problem that will end up costing you a small fortune to solve. Employing the services of a company specialized in professional eavestrough cleaning and repair saves you from two troubles: the unpleasant and dangerous chore of cleaning your gutters by yourself and the trouble of waking up one day to realize that your gutters have detached and the water and dirt are pouring all over your beautiful house. If you live in Penticton, Gut-R-Dun can offer you professional gutter cleaning services that will eliminate this unpleasant chore from your life and will keep you away from the risk of getting hurt while unclogging downpipes. We will provide you with a complete range of exterior services and will use only materials of the highest quality to make sure you that you are completely satisfied with our work. For more information about our services or to schedule an appointment, call us at 250-542-4492.